The Spanish Civil War was fought between 1936 and 1939. Like most domestic conflicts it was a bitter internecine affair, full of propaganda, attrition and brutality against prisoners and civilians. From the beginning of the 1800s, Spain had endured a turbulent political history. For much of this time, it was a constitutional monarchy – but there were repeated attempts to unseat the king and establish a republic. Elections in 1931 saw control of the government pass to republicans and socialists. They proposed some radical reforms: the abolition of the monarchy, restrictions on the Catholic Church and improvements to the rights of workers and women. These reforms were met with hostility by conservatives – as well as the Spanish military, which had suffered from budget cuts by the new government. In July 1936, a prominent right-wing politician, Jose Calvo Sotelo, was abducted and murdered, apparently in retaliation for the killing of a socialist police commander. A group of army generals – including Francisco Franco, Jose Sanjurjo, Emilio Mola and Juan Yague – plotted to seize power. Realising a military coup was inevitable, Spanish politicians began arming socialist groups to defend the republic. War eventually broke out on July 17th 1936. It would be fought by two broad-based coalitions: the left-wing Republicans (liberals, socialists, communists and anarchists) and the right-wing Nationalists (monarchists, conservatives, Catholics and the Falange, a black-shirted fascist group). By early 1937 the Nationalists held the western half of Spain, as well as external territories like Morocco and the Canary Islands. It would take them another two years to capture the rest of Spain from the Republicans. Fighting for major cities such as Madrid, Barcelona and Valencia proved particularly fierce. A notable feature of the Spanish Civil War was foreign involvement. To many observers, the civil war in Spain was the first battle in a much broader conflict – the struggle between left- and right-wing ideologies for control of Europe. The Spanish Civil War captured the imagination of thousands of volunteers, who journeyed to Spain to fight for its political future. The majority of them belonged to the International Brigades: regiments of left-wing sympathisers who fought alongside the Republicans. More than 9,000 Frenchmen joined the Brigades; so did the ‘Abraham Lincoln Battalion’, a corps of 3,000 American volunteers. About 1,000 Canadians and 60 Australians also fought with the Republicans. The Nationalists had considerably fewer foreign volunteers; the largest contingent (around 800 men) came from Catholic Ireland. The majority of European governments adopted a neutral or non-interventionist position on the war. Nazi Germany, however, rushed to back the Nationalist forces and their leader, General Franco. Hitler’s public justification for providing military support to the Nationalists was his desire to prevent communism taking hold in western Europe. Privately, the Fuhrer saw some clear advantages to a fascist government in Spain. Germany could cultivate the Spanish as trading partners, suppliers of raw materials and iron ore, possibly even as military allies. France would be surrounded and held in check by a ‘fascist triangle’ of Germany, Italy and Spain. Hitler also believed the Spanish war was an ideal opportunity to test the mettle of his newly-restored armed forces. He was particularly keen to assess the performance of the Luftwaffe (air force) in combat. Within two weeks of war breaking out, Berlin sent 20 planes and pilots to the Nationalists to assist them with flying in 3,000 troops stationed in Morocco. Most of the German military personnel who travelled to Spain for these missions were volunteers. They later became known as the Condor Legion. Over the coming months, German aircraft and personnel continued to assist the Nationalists: moving men and supplies, providing air cover for Nationalist ships in the Mediterranean, and carrying out bombing and strafing runs to support Franco’s ground troops. Germany also provided training for Nationalist officers, thousands of rifles and small arms, even a radio transmitter for broadcasting propaganda. In October, Hitler authorised the deployment of German submarines to assist Franco’s men. By the end of 1936, there were around 7,000 German troops and airmen fighting in Spain. The most controversial German action during the war was the bombing of Guernica. A small town in northern Spain, near the French border, Guernica sat in territory controlled by the Basque Army, a left-wing group fighting with the Republicans. In April 1937, German Condor Legion aircraft were ordered to support a Nationalist advance into the area by carrying out bombing runs on important roads, bridges and installations. On April 26th – a market day in Guernica – around 20 Luftwaffe bombers attacked the town in waves, pounding it for around 20 minutes. There is much debate about the death toll – Spanish, British and Soviet observers suggested the raid killed at least 800 people, the majority of them civilians. Foreign journalists found bomb casings bearing German markings and reported this in the world press. The attack on Guernica led to international condemnation of Hitler and his involvement in the Spanish conflict. German troops remained in Spain until Franco’s Nationalists secured victory in April 1939. In total, Germany supplied around 16,000 men, almost one hundred planes and $US215 million to the Nationalist cause. Though this was dwarfed by the Italian contribution (75,000 men and 600 planes) it was still an important factor in the Nationalist victory. The Spanish Civil War caused the deaths of more than a half-million people and gave rise to a fascist government, led by General Franco. Because of its ideological nature and the involvement of Germany and Italy, the Spanish Civil War is sometimes considered a ‘dress rehearsal’ for World War II. Hitler’s objectives for committing German forces to Spain were only partly successful. Until late 1940 it seemed likely Spain would enter the war as a German ally. Hitler and Franco met in October of that year to discuss a military alliance – but the two leaders did not get along and failed to reach agreement. 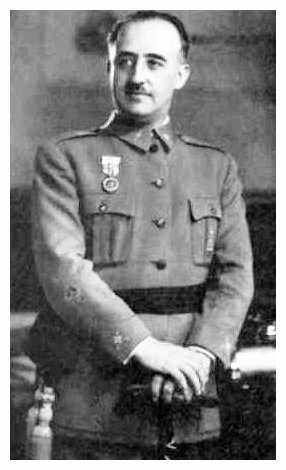 Franco demanded large amounts of food, military supplies and foreign territory for committing Spain to the war; Hitler thought Franco’s demands were excessive and refused to agree. Given that Spain had been ravaged by three years of civil war, it had little to contribute anyway. Spain remained neutral, though Franco allowed Nationalist volunteers to fight with the Nazis against the Soviet Red Army. 1. The Spanish Civil War (1936-39) was fought between left-wing Republicans and right-wing Nationalists led by General Francisco Franco. 2. The political nature of the war attracted foreign media attention and volunteers who travelled to Spain to fight. 3. Hitler and Mussolini sent men and supplies to support Franco’s Nationalists, viewing the war as a testing ground for their military rebuilding program. 4. Germany’s contingent, the Condor Legion, was comprised mainly of planes, pilots and aircrew, who provided aerial support and bombing on behalf of Franco’s forces. 5. Franco won control of Spain by 1939, but despite Hitler’s commitment to the Spanish Civil War, he was unable to secure a military alliance with Franco’s government. J. Llewellyn et al, “The Spanish Civil War”, Alpha History, accessed [today’s date], https://alphahistory.com/nazigermany/spanish-civil-war/.